The "details", "map it" and "chart" text links have been replaced with icon links. Many of the stats tables have been upgraded to collapsible AJAX panels. This looks nicer and also allows you to hide stats on the page you might not be interested in. Simply click on a panel header to toggle collapsing/expanding it. On the prediction page for each golfer, the data has been moved around into more logical collapsible panels. This also allowed the simplification of the labels and therefore the key at the bottom of the page. 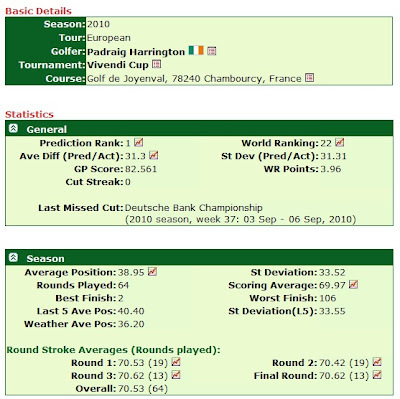 The data on the season stats page for each golfer has been similarly re-organised. If the golfer has no relevant statistics, the panel will just show a message to that effect, rather then a slew of blank statistics and chart links. The graphic above shows a portion of the new prediction page (for Padraig Harrington in last week's Vivendi Cup) with the new panels and link icons. Every page has been tested in Firefox and IE, but bugs may have slipped under the radar. If you spot any, please let us know and we will fix them as soon as possible. Just another way to make Golf Predictor even better! Note: You may have to refresh a page in your browser, if you recently viewed it.